Dessert Tasting Week is back! Enjoy a flight of our Famous Flying Apron Desserts. 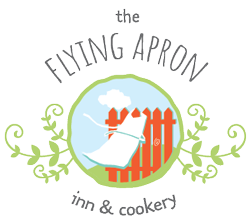 The Flying Apron is known as a dessert destination and people travel far & wide to enjoy our great selection of house-made desserts. One of the hardest decisions our restaurant guests have to make is which dessert they will enjoy after their meal. Don’t want to choose? Join us for Dessert Tasting Week during the first two weeks of April to sample your way through our dessert case. Dessert Flights will be available with either 3 selections ($9) or 5 selections ($15). We will have a variety of desserts available throughout each day, including gluten free options. The selection will change as we sell them and make more desserts! We will also have our full sized desserts available for purchase. We will also be offering an expanded selection of appetizers on the restaurant menu. Restaurant reservations not necessary but we are happy to book space for you; just call us at 902-633-2300 to reserve your table!